The audio was transmitted through a Synchronator device that translates audio frequencies into RGB spectrum video frequencies. I admire the concept of translating one perspective into another using color and music. The title, Colterrain might also be either an unintentional or intentional reference to John Coltrane who translates the feeling of what is around us into music, with audible colors and textures in his sound. Listening to Coltrane gives a multi sensational experience through the different use of sonic textures and colors of the notes. I found this piece called Forms by collaboration of Memo Akten and Quayola very intriguing. It is inspired by modernist cubist works, but unlike those ones, Form targets at exploring the extrapolation to form abstract forms instead of the simple observable objects. Form uses algorithm to present and transform the actual human movements into representative forms such as line and squares. And I really admire the fact that the artist focused on the inner quality and relationships of human form and its surroundings rather than observable features. Moreover, the ability of the artists to unseen the recognizable form of human body is absolutely stunning. Even though the outcome is so abstract that it is even somewhat difficult for the viewers to understand which motion is presented. However, when we see the actual movement and the generated representations side by side, we will defiantly be amazed by the accuracy of the abstract. David Mrugala is a German architect living in Korea that developed an interest and expertise in generative art. I discovered David Mrugala through his recently launched blog, hosted on tumblr, http://thedotisblack.tumblr.com/. 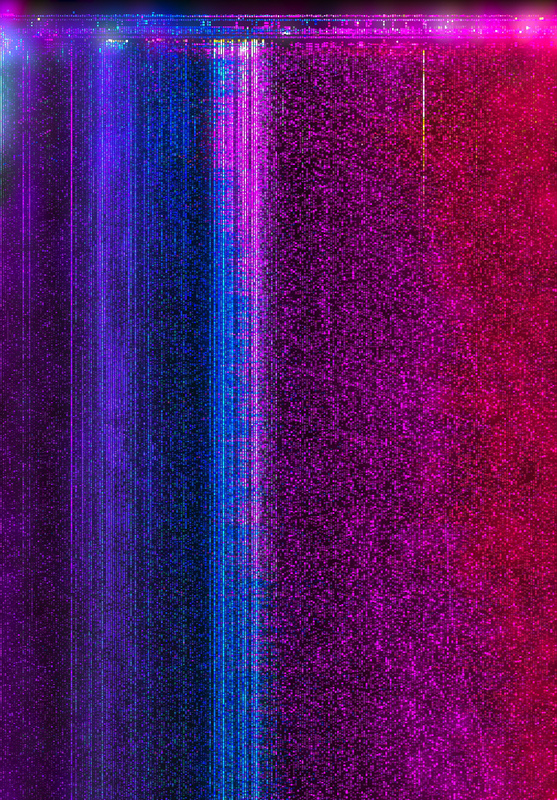 It features all of his generative art, which is stunning. Something I particularly enjoy about David Mrugala’s work is his attention to making it seem less like digital artwork, and more as if it was down by hand – or with physical mediums such as paint or ink. 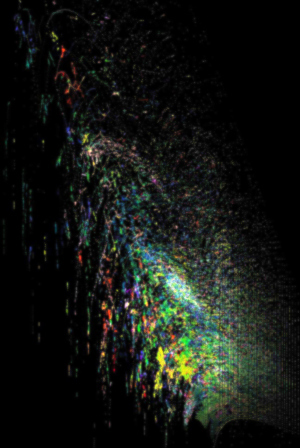 It was Mrugala’s approach to generative art is highly informed by his architecture background, “in general, I think that in contrast to other art and human endeavors, architectural design is the one which is the most generated by intellect, consciousness and reason,” quotes David Mrugala. His passion for the precise geometry of generative art is evident throughout his work. And his background, both locally, and in career is reflected in his amazing artwork. I admire Joseph Nechvatal’s ‘Computer Virus Project’ as it embraces both real and virtual worlds into his work. 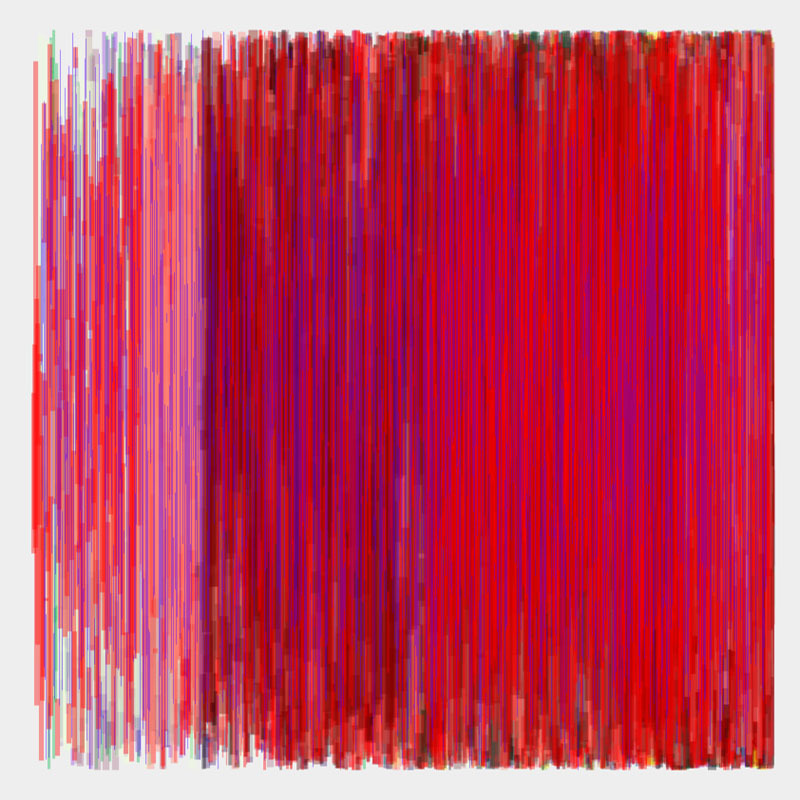 He, in his previous works, has produced physical canvas from codes and algorithms. The ‘Computer Virus Project’ uses algorithms to produce ‘viral processes’. The algorithm allows the original graphic to be destroyed and damaged by the ‘virus’, which is then redisplayed to create brand new images showing the outcome of the ‘attack’. The algorithm used in 1992, mainly worked as a tool for Nechvatal to design the image and to plan out the ‘attack’ on the original graphic. Nechvatal carefully selected different colours to apply onto the canvas and mapped out pathways for the viruses to create mirroring patterns. Compared to ‘viral attaque’ 1992, ‘Virus cOde’ 1993 uses actual algorithms and codes to produce an artwork full of letters, numbers and functions. The ‘Computer Virus Project’ produces abstract images that consist of painting-like features, which is what I admire the most about his work. For this looking outwards I focused on the artist Jono Mi Lo who is currently a Pittsburgh artist but is primarily known as a “net” artist. Jono has worked in a variety of media ranging from experimental music, video production, generative media, and generative sound as well as many other fields/specialties. In particular I feel drawn to some of Jono’s work due to the content of his work as an African-American living in the United States in the 21st century. Especially as one working in new media and “net” art. Some of his work deals with the issues of race in the modern America police state and also draws on influences of history though biblical verses or references. Jono’s generative music usually lies in the realm of experimental music drawing on brute noise and rhythm to create complex soundscapes that draw the listener into a world not of their own creation. 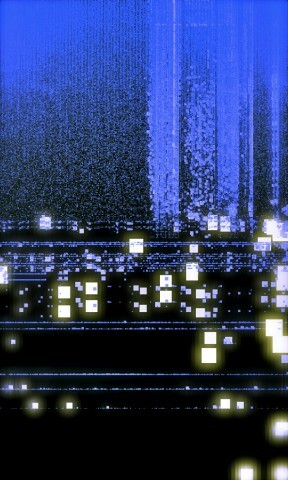 He has also done some work in creating the soundtrack for a generative video game, seen below. Emulating Michelangelo’s deliberately unfinished marble sculptures, Quayola’s 3D renderings of bodies are called Captives. 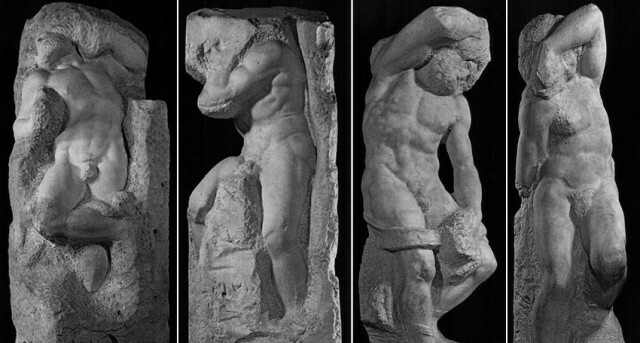 As Michelangelo puts it, they have yet to be freed from the medium by the sculptor. 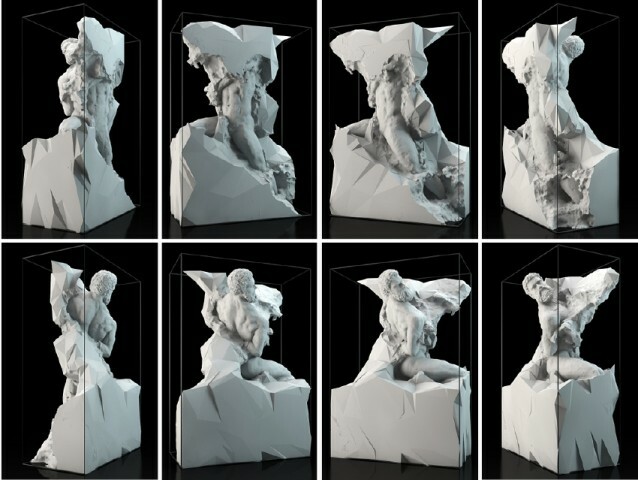 Reborn from the Italian Renaissance, these figures embody Quayola’s focus on the interaction between novel and old ideas, as well as chaotic and controlled forms. 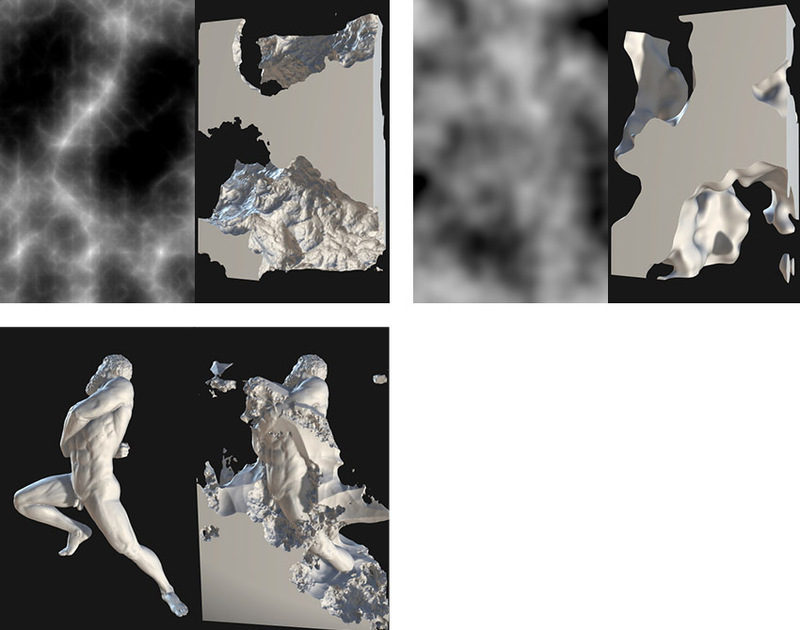 Compared to Michelangelo’s, Quayola’s computer-generated rock patterns reveal their artificiality. However, Michelangelo had an advantage. Whereas he simply had to halt his usual reductive sculpting process to show the jagged marble material, Quayola had to virtually manifest the same crazy shapes from an organized system. Luckily, nature acts in patterns, patterns that Quayola knows how to program. It’s a mystery to me what exact formulas he used, but somehow his algorithm arranges chaotic forms in deliberate places. Captives impressively illustrates the relation between chaos and systems, computation and nature. 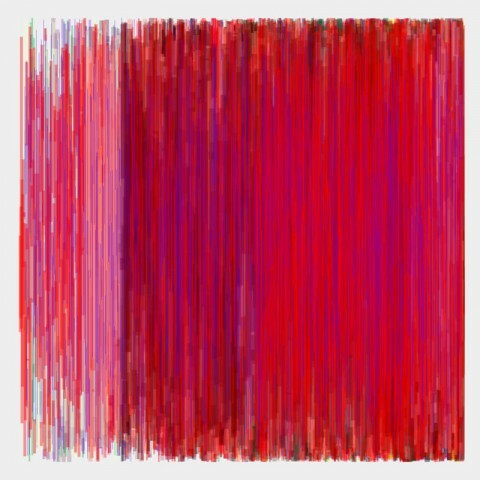 This generative art by Jack Whitsitt called “Art and Security in Washington, DC” takes raw images of data collected with the Symantec computer security program and then the artist stylized the images to make them into beautiful works of art. The data is from the real world, such as someone browsing the web (image 1), or a visualization of network traffic (image 2), or a plot of security data (image 3). I admire how this art takes real user data and visualizes it in a way that is less analytical and more emotional and affective. It is a cool way to share data with people and help people appreciate data in a way besides just for its analytic and business-oriented value. In this case there was not really an algorithm that generated the art directly, there are of course algorithms used in the Symantec security program to make it run and collect user data, and then the images of that data are what the art is based on. So in a sense the security system’s algorithm’s generated the art. We can see the artist’s style in the colors he chooses and his use of light when he edits the data images. In some images there are a rainbow of colors, in others only a few colors. In some images he highlights some data points to accentuate them and leaves other data points more dark and dull. Link to more images of Whitsitt’s work. Knyttan is a generative clothing manufacturer that allows customers to design their own fabrics to be knit by machine. What fascinates me most about this is the introduction of digital fabrication technologies into what appear to highly craft-based realms. Typically, fabric arts are not considered to be very technical. However, weaving especially has always had a strong computational element (i.e. Jacquard looms, warp/weft patterns, iterations, arrays, etc.). What this project brings into the realm of fashion is the ability to generatively create soft three dimensional forms in a whole new way. It’s curious how long it has taken for the fashion industry to come close to reliably producing garments on a mass scale. Most digitally fabricated garments prior to this could hardly come close to being called “garments”—they were hard, made out of plastic, did not shape to the body, and were above all, uncomfortable. No wonder Knyttan seems so successful here—they looked back into the history of this medium and simply updated the process by which it can be produced. You can make your own sweaters and scarves here. Jessica Rosenkrant and her studio, Nervous System, make generative designs for jewelry and houseware (like the ring below). Their designs are based on geometric figures and patterns found in nature. Rosenkrant studied biology and architecture while the co-founder of Nervous System, Jesse Louis-Rosenberg studied math, which lead to their interest in combining natural phenomena, designing, and mathematics. The algorithms they use are meant to create a product which combines many different types of iterative designs. Their algorithms are responsive to changes in different variables so no one product is the same. Because their algorithms are not final, they are able to create customizable products for their customers. I admire how the products they make are unique, elegant, and affordable. The products represent an intersection of the STEM fields and art, leading to designs you wouldn’t see elsewhere in other jewelry stores.